This entry was posted on Sunday, March 9th, 2008 at 9:47 pm and is filed under Art, daiza, Suiseki. You can follow any responses to this entry through the RSS 2.0 feed. You can leave a response, or trackback from your own site. The main thing is that I hope people come to realize that there is no pope or queen anywhere telling people what is okay. What stones you like and how you choose to present them are personal decisions. In Mas’ case these are fundamentally artistic decisions. Regarding competitions though – I don’t know about that. A competition does imply some set of formal “rules” that everyone agrees to. If your competition is for recognition of someone’s craft skills as a wood carver then yes, it would make sense to separate cut-stone and uncut-stones into separate categories. They are different levels of difficulty and require different skill sets. But if the competition is between stones (as opposed to between wordcarvers), then what are the criteria on which they are being judged? Presumably you are applying some set of formal criteria? For example – so many points for color (black gets most points, white gets fewest), so many for adherence to the rules for various shape categories (how well they follow the three-sides rule, how good the kamae is, the location of the peak, etc etc), so many points for material (deducting points for too hard or too soft, recent sharp edges, and so on. Etc. Etc. In that case, I would think that you’d handle that by simply assigning more points to a “natural” stone than to a cut-stone. And depending on the other qualities of the overall suiseki, the cut stone may very well “win”. After all, a mediocre uncut suiseki is, well, just a mediocre suiseki. I do think that studying those formal rules is important in learning suiseki (or any art), whether as an artist or as a critic or collector. Formal judging can be an very good learning tool. We do this all the time in our Bay Island Bonsai club as part of our study of bonsai – though we tend to do it as a club exercise, even in making the awards in our yearly show, rather than as a “competition” between people. Sorry, I wanted to refers Mr. Mas Nakajima instead of Mr. Mars. It was my mistake. A suiseki, a friend from Spain. Reading this article, it has made me reflect on a very interesting idea, and that is cut or not cut is more a matter of aesthetics than a question of whether or not to be cut, based on whether the Suiseki is conceived as a modern art or more whether it is conceived from a traditional Zen perspective , tea ceremony, and so on. I believe that at the end, like everything else in life, depends on the choice of each person, the approach that you want to give, but none is better than another, and that, as the Nakajima says, both tendencies coexist, and although a stone has less value to be cut, they are cut and retouching, in Japan and USA. I personally have cut all the stones that come from U.S., and aesthetically, they are among the best of my collection. I believe that we still have much to learn and experience in Spain and that it may even go by seasons and fashions. Today, in my country, it seems that there is a tendency to consider that the stones should not be cut and if they are cut, they will not be exposed. I think that to allow to cut in a competition is to allow that someone could use some techniques and tools that others can not use because it is not at your fingertips. I think it would be great to make an exhibition of uncut stones and other for stone cut, but all under the same conditions; so that some were not better than others by the mere fact that I can not cut my stone and if the other person can cut . Can you imagine a race in which cyclists were some bicycles in iron and other bicycles were in aluminum, high-tech?, Certainly they could not compete on equal terms, because this is what I think happens when a Exibition of Suiseki are competing for first prize and some stones are more likely than others simply because not everyone can use the same tools to beautify their stones. Your post and further comments come just in time, when there’s now a hot debate in Spain about “to cut or not to cut: that is the question”, but without regards to yin-yang. Of course, I will refer you in trying to balance. However, I’ve got enriched by the underlying feeling of “-do” flowing from your comments, as I often wonder whether Westerners prefer to talk about rules, criteria, proportions and so no, but forget that most Oriental “arts” are to be developed (lived) within a sense of personal way. Thus, a person may start from cut-stones, and further walking and twisting forward and back uncut stones, and even so, this will be only one within miriads of possible ways to learn from contemplation of stones. 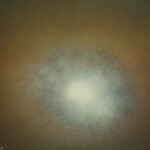 Contemplation of stones: this is the fullness and the emptyness and you are required to no-distraction to fully achieve. When you are in contemplation, you should not be disturbed about whether it is cut or uncut; whether you are pushed to think about it, the stone is not good enough for contemplation. Thanks, Janet for your inspiration. Thanks for this post — I’d wondered about this and found your write-up informative. Hi Mark – yeah, there is a feeling from an un-cut stone – well it’s not something one can put into words. It’s not an intellectual thing. It is undoubtedly spiritual even for those us for whom it is not, strictly speaking, religious. Finding an stone that can be made into an excellent suiseki without any alteration is an amazing thing. I have in my life been fortunate enough to find two stones that I feel are in that category – I may never find another. When we are on tanseki, for every possible stone I find, Mas finds 5 others at least. Part of it is of course his experience. He knows the stones so well, and what the good quality material looks like uncleaned on the river bank. He knows how a well-shaped stone appears when just lying there. So he looks at lots of likely stones, and doesn’t look at ones that are unlikely. I sometimes do kind of the opposite (I have a tendency to let my eye get attracted by flashy color – which is often poor, crumbly material and the color itself will end up bothering). My eye and experience is improving though with every stone (good or bad) that I pick up and look at. Like you – I often look for something – sometimes smaller stones with flattish bottoms. Sometimes stones for cutting (more prevalent). When I was just beginning years ago I was always looking for doha (easy to find mediocre ones) . But – I’ve been learning not to. I have been learning to do like Mas and just open my mind and eyes and try to just look at each stone for what it is and what is there. I don’t know if that makes sense? It’s hard to put into words. If you look *for* something, it makes it harder to find what is actually there. At least, that’s my experience. 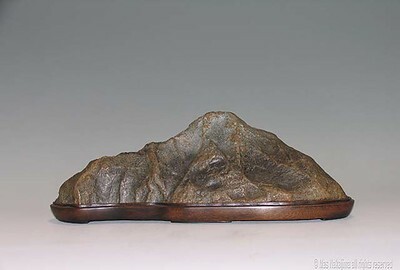 Also I think for the artist, cut stone suiseki (good ones I mean) are a very good way to develop their artistic eye as well as developing their daiza-making craft and technique. One of our fellow SF Suiseki Kai members is a guy who has an amazing eye at the river. So far he has only made daiza for, and shown, his cut stones. He does very good work (he commonly gets one of the awards at the August exhibit), but has only been doing it for maybe 10 years and does not feel ready to tackle his natural stones. That time will come. I appreciated your approach on this subject. Even with those who cut stones or own cut stones, I sense at least a small dissapointment when learning a stone was cut. Although not founded in religous beliefs, I admit to feeling differently about uncut stones. The stone you used as an example is just amazing and a great a argument for cutting. It is so good it quickly makes you forget it was cut. As with all Mas’s work the daiza is in perfect harmony with the stone. One thing that disturbs me is when a daiza is too thin with cut stones. Two reasons, first because it screams that the stone was cut and the proportions bother my eye. Secondly, and perhaps the main reason, the daiza seem to warp exposing the cut edge of the stone. I also wonder if how you feel about cut stones influences your collecting. I look for stones which have relatively flat bottoms as opposed to stones I could slice a Suiseki from. If your eye is trained to look for stones within stones I think this could impact what you find. Janet, thank you for your wonderful work with this site. I really enjoy it and look forward to every new post! Hi Scott. From what Mas tells me, there are a bunch. In the old days, before machinery, they would work the stone with stone carving tools and then put it in a stream (I guess in a bag or box) to allow the natural sand-blasting to occur over a few years. As far as modern machinery he’s described a couple of methods to me. Sand blasting equipment of course comes in both air and water versions. Then there are the stone carving tools used by people like gravestone makers. As for stone carving – he thinks that probably the Chinese had many techniques which Japanese craftsmen used. One old method for jade carving for example used a string – with (harder?) jade bits embedded – like a saw. Since suiseki material is generally softer than jade something like this would work also I would think. I should note that apparently they have figured out that many of the famous old meiseki were in fact altered. (They’ve used xray crystallography I believe to figure this out). I gather that even stones from Rai Sanyō and the famous Floating Bridge of Dreams were apparently altered (though I guess that last in China since that’s where it came from). Very informative article, as I was unaware of the Japanese practice of sandblasting to modify the stones appearance/edges. What are some of the other techniques that are used? Perhaps water or laser cutting? Very interesting, thanks for sharing.